To see how the Oregon 450t stands up against other Garmin models, check out my Garmin handheld GPS comparison chart. Portions of the following were adapted from my hands-on reviews of the Garmin Oregon 450 and Oregon 550t. The 450t’s pre-loaded topo maps of the entire U.S. may appeal to those who travel a lot, but there are few other reasons to go for this model. Why? There are better quality 1:24,000 scale topo maps available for free for most states. GPS File Depot is a great source for such maps. I recommend that most buyers consider the Oregon 450 instead of the 450t and simply load it up with whatever maps you need. 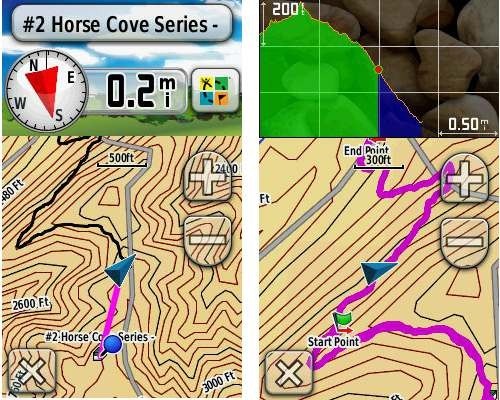 With the recent introduction of Garmin custom maps, you can now put about any map image on your Oregon. Found a park trail map online? Add it to your GPS! The image at left below shows a custom map — a USGS topo map (raster) image. 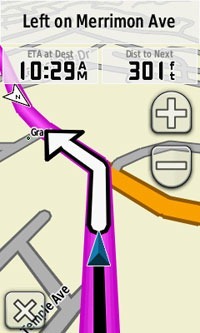 You can read more about this feature by checking out my posts on Garmin custom maps. Garmin also recently announced their BirdsEye aerial imagery program, a $29.99 annual subscription that will allow you to add aerial imagery to the Oregon series. The image at right, above, shows a screenshot. All of the newer generation high-resolution GPS screens suffer a bit when it comes to visibility. The 550 series is slightly better than the x00 first generation, but the newer 450 series seems better yet. As a matter of fact, it’s the first Oregon I’m going to recommend for fixed mount, non-powered use, such as bike handlebars. In the past, I’ve recommended Oregons primarily for handheld use, where you will intuitively tilt it for the best view. While the most notable enhancement in our Oregon screens was from the x00 to the x50 lineup, customers may notice other improvements that are a result of various hardware and software improvements. The difference is seen in sunny, bright conditions only. I could not detect much difference in shade. And regardless, in at least some conditions, the 450 series still isn’t as bright as older units that don’t have such high resolution screens (e.g., the 60/76C and eTrex C series). But the huge number of improvements the Oregon series is accumulating leaves me with little reservation in recommending them over previous model lines. With the recent improvements in screen technology, visibility just isn’t a deal killer, even for bikers. Even so, I still recommend that users create sun and shade profiles to improve visibility (discussed a little later in this review). Having a tri-axial compass means you don’t have to hold the unit level while navigating. The downside is that the calibration process is more complicated than that for a two-axis electronic compass. It’s the same procedure that is used on the Dakota 20 — here’s a brief video I shot of it. The compass should be recalibrated every time you change the batteries in the unit. Like most GPS receivers with an electronic compass, the 450t also includes a barometric altimeter. 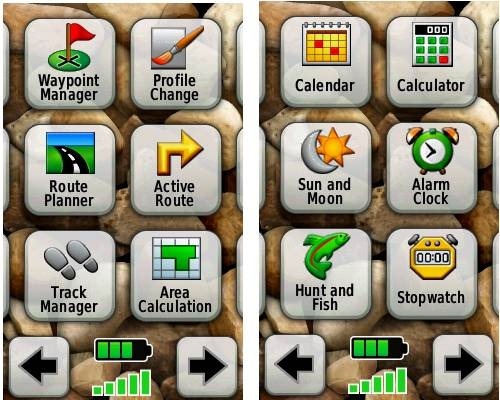 Handheld GPS receivers typically offer lots of options, and can be overwhelming for a first-time user. Even so, the touch screen Oregon is about as intuitive as they get. The main menu is spread across five screens (as shown below); these can be customized, so if you don’t need “Man Overboard”, you don’t have to display it. Use profiles – There is a “Change profiles” item on the main menu, and you can create a new one via Setup > Profiles. Tap the new profile to give it a name. Now start changing various preferences. Want track up when geocaching and north up when biking? No problem. The possibilities are nearly endless. Rearrange the main menu – Set this different for each profile. I make extensive use of the Track Manager, so that gets moved to the first main menu screen for my hiking and biking profiles. Create sun and shade profiles – A great use of this tool is to create separate sun and shade profiles (perhaps even one for each activity). Create a Sun profile and then go to Setup > Maps > Advanced Map Setup. Set Shaded Relief to Do Not Show to enhance visibility in bright light. If you’re in an area with lots of national parks and forest, you can also improve visibility by getting rid of the green background. Go to Setup > Map > Advanced Map Setup > Zoom Levels > Land Cover and set it to Off. Credit GPS Fix with originating these tips for sun / shade profiles. Dashboards – The map screen can be set up to show 0, 2 or 4 data fields, or to display a dashboard. Choices for the latter are recreational, automotive, stopwatch, compass, large data field, geocaching (nearest or active) or elevation plot. I’ve included screenshots showing the last two below. 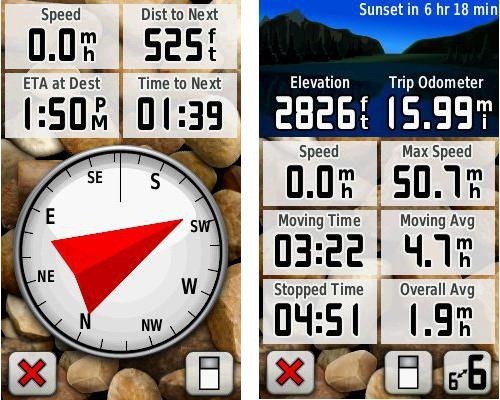 Shown below are the compass and trip computer screens. The data fields can, of course, be customized, as can the background. The trip computer screen can be also switched to show fewer (but larger) data fields. The top section of each can be modified display one of the previously mentioned dashboards. Finally, here’s a random interface tip… When you select a location on the map, a push pin appears. You can now slide the map around underneath the pin, and zoom in as needed, to fine tune the selected location..
Waypoints – The ability to project a waypoint, and to reposition one at your current location. Tracks – You can choose to hide or show tracks on the map and give them a custom color (17 colors are available). The image at the right shows a track in light blue (a record of a previous trip). The Oregon 450t features some recent improvements in track navigation. 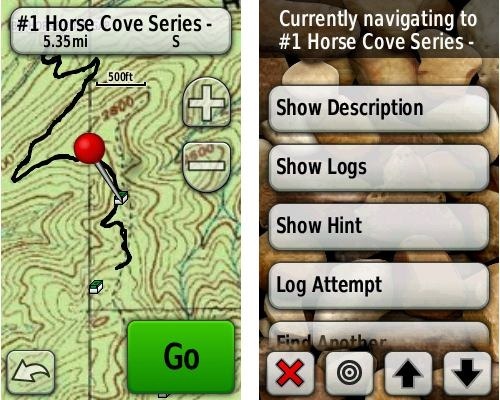 Select a track to navigate and a route will be created. Waypoints are created for the high and low elevation points and any user waypoints along the track are added to the route. I’m a heavy user of track navigation. 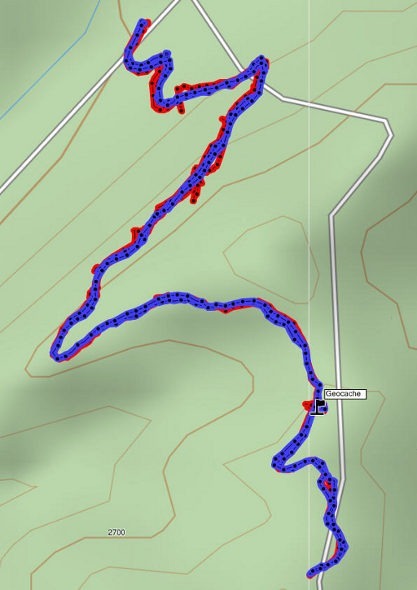 If I head out for a trail I’ve never traveled before, I do a search online for tracks (favorite search terms are .gpx, gps, trail name, and park name) and load the track to the device. One advantage of this new track navigation feature is that, unlike typical backcountry route navigation, you’ll get an estimate of actual trail distance rather than “as the crow flies” mileage. The Oregon 450t is set up for full paperless geocaching support, meaning you can see the description, logs, and the hint, and you can log your attempt (find, DNF, etc.) for later transfer back to geocaching.com. 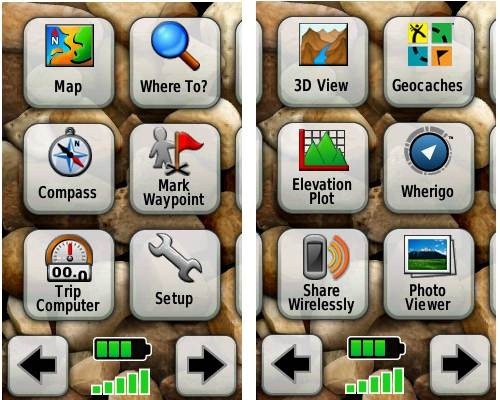 Speaking of which, full access to these features requires a premium membership at geocaching.com. 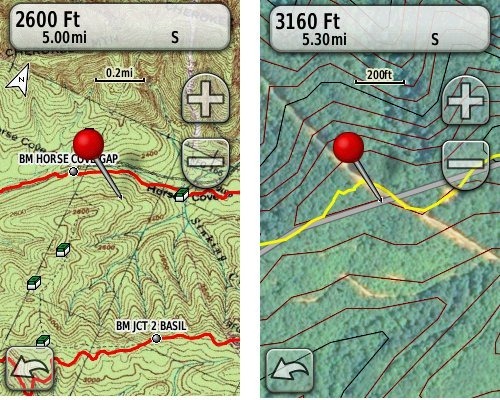 Shown below, clockwise from top left: Closest geocaches, geocache description, menu for a specific cache, and custom map using a USGS topo. The Oregon 450t is capable of wireless data transfer with other compatible Garmin units. 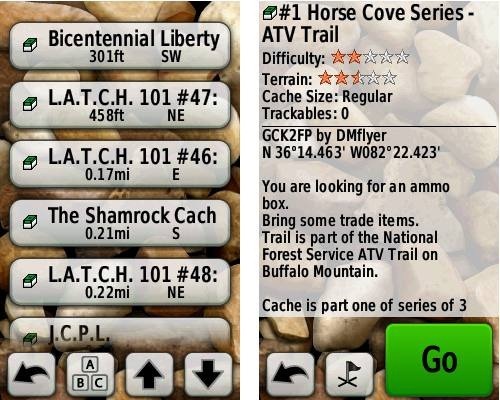 You can transfer waypoints, tracks, routes and geocache summaries (paperless caching details cannot be transferred). The Oregon 450t makes an excellent dual-use unit, though you’ll probably want City Navigator and a car kit if you want to use it as a turn-by-turn navigator in your car. If I wanted a single unit for trail and road, an Oregon plus City Navigator (screenshot at right) would be my top choice. The sibling Oregon 450 unit performed very well for me in testing against multiple units including the Garmin GPSMAP 60CSx and the Magellan eXplorist GC. I noticed no significant differences in accuracy at ground zero when geocaching. Multiple tracklogs were collected, comparing the Oregon 450 and the Garmin 60CSx. Tracking was set to collect points every five seconds while mountain biking. Steep terrain ridden in both directions, combined with frequent stops to record notes, resulted in good testing environments. In the images below, the Oregon 450 tracklog is in blue, the 60CSx is in red. I’ve compiled these four tracks in a single .gdb file, which you can download and open in MapSource or BaseCamp for closer examination. In one test, shown below, the 60CSX wandered a bit more than the Oregon in a few spots, while the Oregon track separated more at one point on the uphill and downhill runs. This test was a draw. In the test below, the Oregon significantly outperformed the 60CSx. I’ve labeled a geocache at one point, because I moved around a fair bit there. Still there were two other points where the 60CSx wandered significantly. Each unit had a single instance of track separation on the uphill and downhill segments. Battery life is rated by Garmin at 16 hours. In my testing it ranged from 10 hours, 27 minutes (backlight always on) to 16 hours, 51 minutes (backlight timeout set for two minutes, battery saver mode enabled). Battery life tests were conducted with the unit stationary, using Eneloop low discharge rechargeable batteries. One other performance note — I’ve always been very impressed with how accurately my 60CSx reports overall elevation gain, and disappointed with the inaccurate numbers generated by my Oregon 400t. I was pleasantly surprised to see that the Oregon 450 is extremely close to my 60CSx in terms of reported elevation gain. I hope to do some more testing before I send the review unit back to Garmin, and will post a full report here. UPDATE: Well, I set out on the trail to test this out and to my surprise, the 400t, 450 and 60CSx were all within 2% of each other. Perhaps Garmin fixed this on the Oregon x00 series in their most recent firmware update. Go figure! Highly recommended. The Oregon 450t is a great workhorse. The interface is very user friendly and it has a lengthy feature set. It is an excellent choice for nearly any outdoor activity, including geocaching and hiking. This is the first Oregon series I’m recommending for bikes too, due to the improved screen visibility, which makes it more appropriate for fixed-mount use. What is its altitude & horizontal location accuracy.Can I load Topo maps of Pakistan? Excellent review. Definitely purchasing this unit. Thanks. Do you know if I can record a hike then upload it to garmin connect with this unit? I can’t figure it out. I have an edge 800 and it calls such things activities, but I can’t find activities on the 450t. Thanks for any information. You should just be able to connect the Oregon, sign into Garmin Connect and hit the Upload button on the website. Does that not work? I am trying to transfere routes to my Garmin Oregon 450T. When I draw a route useing Base Camp I save it via my PC then transfere it to my Oregon. On my Oregon the route shows up as “as the crow flies” between my starting and ending points; a straight line. What am I doing wrong? Why will it not display the route I drew in Base Camp on my PC the same way on my Oregon? Any help is appreciated. Thanks. Are you using the track tool or route tool? Sorry for my delayed reply. I Am using the route tool. I thought tracks are where you have been and routes are for planning. When I draw the route on Base Camp using Garmin 24k Topo I traced the trail as indicated on the map via the computer then save the route. 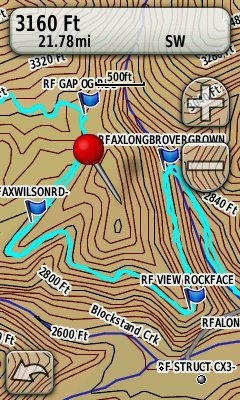 I then transfer to the Oregon which has the same 24k Topo map. Yes, that’s the traditional definition of routes vs tracks, but routes are always as the crow flies straight lines. Try the track tool. Thank you. I will try that. I thought if I traced/hi lite a trail that is shown on Garmins 24 k Topo using Base Camp it would show up on the Oregon as it shows up on the PC. Just do not understand. Thanks again for your help. This is the best site for GPS information. @Curtis – Ah, I think I see. You’re using Garmin 24K with routable trails. I’ll try to remember to test it myself in the field next time I’m in an area with their trail coverage. Go to Setup > Routing and choose Prompted Under both Activity and Calculation Method. 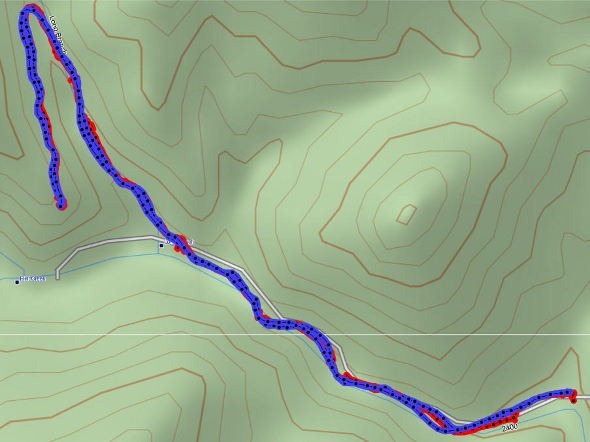 Now when you choose a route using Where To, you’ll be prompted to select from choices including Direct Routing (straight line) and Hiking, which should route you along a trail if it’s in the 24K map database. Spot On!! I have not tried it in the field yet, but when I went to Setup> Routing it was set on “Direct”. I am sure it will work because now when I select the Route I had an issue with; it now is displayed along the trail as opposed to a straight line. Thanks so much for your help! Btw…I spoke with Garmin support on this issue and the response I kept getting was “it should not do that” and “never heard of this before”. I just purchased the Oregon 450T for hiking and I’m a little confused about the GPS setting. Since I’ll be using the 450T for hiking mainly in State Forests what is preferred GPS normal or WAAS? Thanks for the info RIch. In my head accuracy is better, but I’m going to try it out both ways this weekend. It is, but it probably makes more difference to geocachers than hikers. If not, what is the exact error message you are getting? Hey, Rich. I have an old 60csx – great unit. REI has the 450t on sale for $200. Would you consider this to be a value upgrade or not? No in terms of screen visibility. Thanks for the quick reply and link. Off to the likely really crowded store with great deals. Hey Rich, here’s another question on my Oregon 450T. When I am out geocaching and switch to compass mode, a lot of times the compass points me in the opposite direction of the cache. For example, it may point E when I know that the cache is W, however when I go to map mode its spot on. Is this a glitch or do I have to toggle something on or off? Thanks. Is your firmware up to date and are you calibrating the compass? And I’m assuming you don’t have the electronic compass disabled. Is your firmware up to date and are you calibrating the compass? *Had version 6.20 and installed version 6.40 but I didn’t see anything in the update notes regarding compass accuracy. Now have latest firmware. *I usually calibrate my compass at the beginning of each geocache hike and sometimes during the hike. And I’m assuming you don’t have the electronic compass disabled. They often don’t list all the issues in a firmware update, so hopefully that will solve it. Are you using alkaline or NiMH batteries? You may see better performance re: calibration with the latter. Also, make sure routing is set to direct/off road. You could also try disabling auto and see how it does once you start moving. Otherwise, it certainly sounds like a firmware bug. Thanks for the tip Rich. 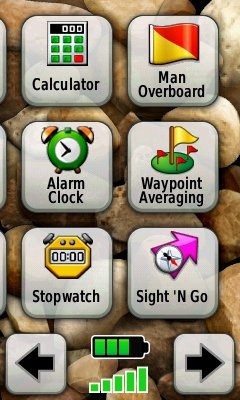 I’ll let you know if that makes a difference on how the compass behaves. Here’s an update – it worked. Thanks for your help Rich. I have been using my 450t for a month or so. Is there any way to customize the submenus to not show all of the options that are rarely if never used? Like when I’m marking a waypoint after I enter the name, I have to go down a full screen to get to the Change Location submenue. It would be cool if the Change Location was right below the Change Name such that I would not have to bypass all of the fluff.